Happy New Year! あけまして おめでとう ございます (Akemashite omedetou gozaimasu!) I hope 2014 is filled with happiness and prosperity for everyone. I’d like to dedicate this new year’s post to one of the greatest Japanese traditions ever – fukubukuro. Translated in English as “lucky bags”. There are few things I like better than a good ol’ bargain and that’s exactly what’s contained within these new year’s goody bags that can be found in almost every Japanese store in the first few days of the new year. Almost every store offers some kind of lucky bag, from designers boutiques to electronic stores offering the chance to scoop up bargain priced video games, consoles and TVs. Even convenience stores get involved offering bags filled with snacks and other edible treats. 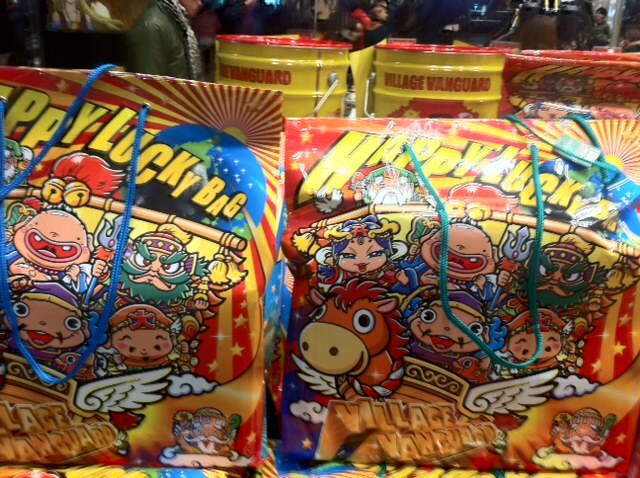 Some lucky bags from popular novelty store Village Vanguard. The best fukubukuro are snapped up pretty quickly – some not long after opening hours on January 1st. I was astonished to see that many stores in Tokyo were open for business as usual on the first day of the year. I was even more surprised to see queues and queues of people lining the streets outside popular stores. It appears that the people of Tokyo never take a day off. Fukubukuro range in price from a couple of pounds to hundreds of pounds and the contents inside are said to be valued at least twice what you pay. The only catch is that the bags are sealed and you have no idea what’s inside. I went with the logic that as long as I bought a bag from a store I liked, I couldn’t go too far wrong. Besides, it’s all a bit of fun. There are many stores that show exactly what’s inside the bags or at least give an indication of what to expect but it’s not as fun as taking a bit of a risk. One of the most popular and sought after lucky bags is the one offered by Apple stores across Japan. For 35,000yen (which is around £203 or $330 at the current exchange rate) you can purchase an Apple goody bag which is said to contain contents worth at least twice that. Some people have even come away with IPads and brand new MacBooks! I found a more detailed post specifically about Apple fukubukuro. bit.ly/19Xh2ET It documents the story of an “enthusiast” who waited 8 whole days outside an Apple store in the freezing December cold to spin the wheel of chance. Anyone else would probably just have saved up to buy the items they wanted but there’s not really any fun in that. I spent New Year’s Day at Tokyo Disneyland so I wasn’t one of the first in the queue to grab the best of the fukubukuro but I feel pretty happy with what I purchased when I went shopping on the 2nd. I didn’t want to spend too much money so I was pretty conservative with my purchases. I’m a bit of a sucker when it comes to bargains and I didn’t want to just buy things for the sake of it and end up with a bunch of useless tat. In the end, I came away with 3 fukubukuros and spent a grand total of 6,500 yen (£37). 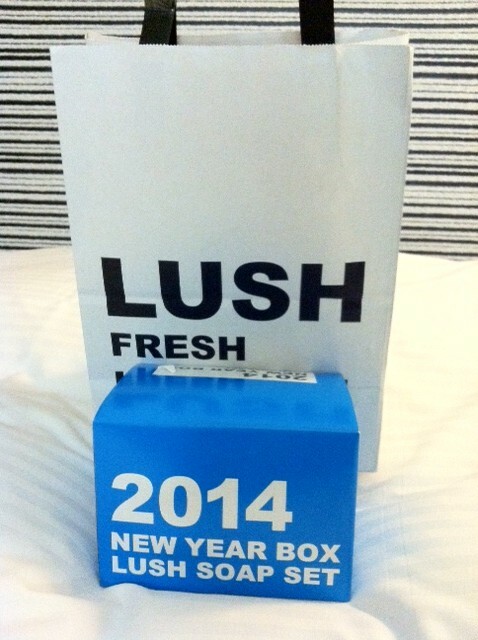 First up was my Lush bag. 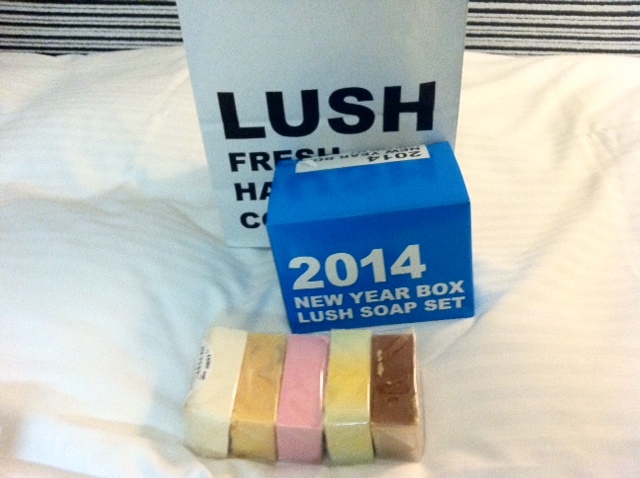 I really love Lush products, the soaps and shampoos in particular. The soaps are priced around 700yen per bar so when I saw this “soap box” containing 5 soaps for 2,000 yen, I knew it was a pretty good deal. I don’t feel like it was such a risky purchase, although I didn’t know exactly which soaps I would get, I like almost all Lush products so was willing to bet that I’d be pretty happy with what was inside. 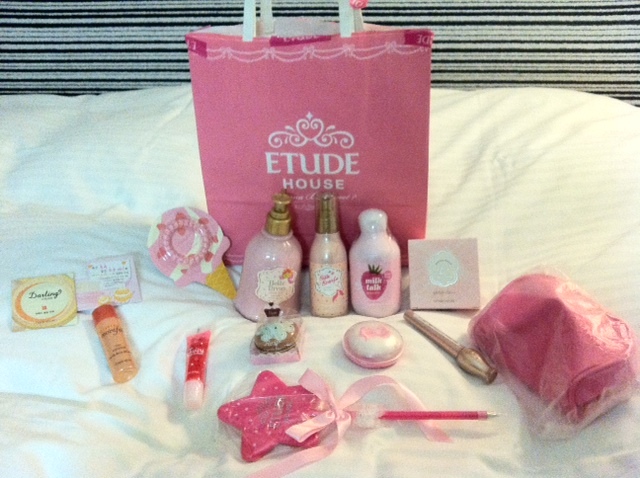 Next up I headed to my favourite Korean make-up store, Etude House. For 3,000 yen I purchased a goody bag filled with 14 items including everything from body lotion and hair conditioner to lip gloss and blusher. Purchasing each item individually would have totaled more than 8,000 yen so I feel like a got a pretty good deal. I love everything in Etude House so I knew I couldn’t go wrong. I was especially pleased with this fukubukuro! Now, the final goody bag was definitely to cream of the crop. I purchased this wondrous bargain in the food court of popular department store Seibu. For 1,500 yen (around £8.50) I received a huge bag filled with chocolate goodness. The theme was chocolate from around the world. Now, if there’s one thing that’s ridiculously expensive in Japan, it’s imported goods. I feel like I know this better than anyone as cravings for a simple German Ritter Sport bar have left me with little change from a shiny 500 yen coin! 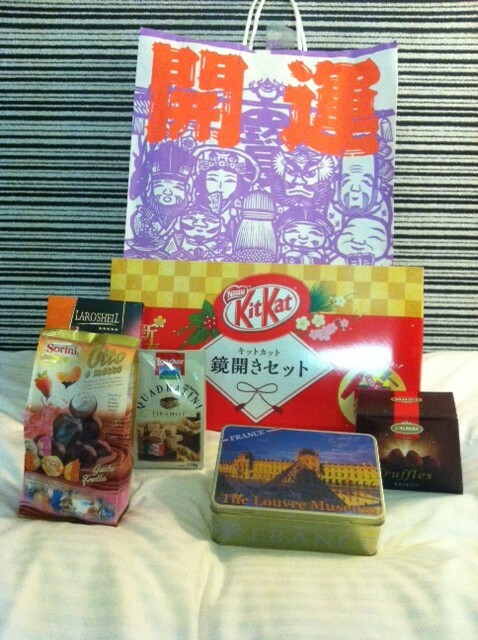 So you can imagine my delight on opening this bag to find a whole host of chocolate goodies from all around the world. It contained Loacker wafers from Switzerland, cookies from France, Grand Marnier Truffles, French truffles, Italian pralines and the biggest box of KitKats I’ve ever seen! Bargain of the century? Almost certainly. Okay, so I’m easily amused but 1,500 yen for all that chocolatey goodness?? I’d value the contents at least 3,000 yen…someone call the police, there’s been a robbery! 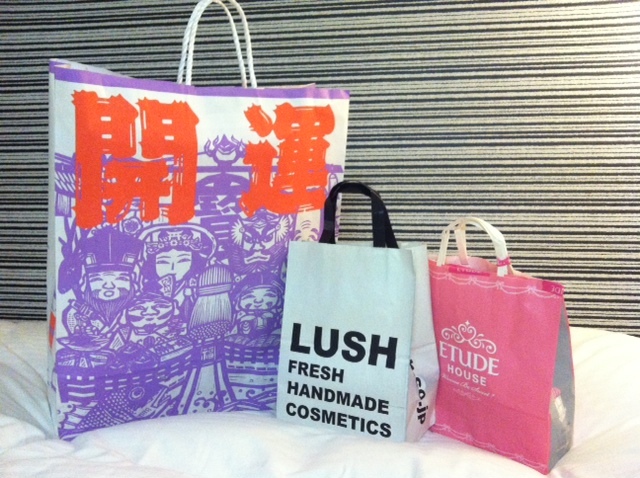 My New Year’s shopping experience in Tokyo was an absolute blast, I really hope fukubukuros catch on in the UK! If you’re ever in Japan around New Year, I highly recommend getting involved in this exciting New Year tradition, who knows what bargains you might get? i love this idea. there used to be a shop in London called Super Lovers in Covent Garden and they did Fukubukuros during the january sale, had no idea they were called that though! I got one for about £10 and came away with about £40 worth of goodies so was pretty successful. I can’t wait to visit Tokyo! loving the blog! Heya, really sorry to leave a comment that is unrelated to your actual post but I can’t see an contact info. I’m wondering if you have any interest in a carnival for Japan-related bloggers. This time I am opening up the possibility of submitting posts that have already been published, so if you have an old post that fits the theme and want to join in, just send me the url and a little “about” for your blog’s profile. I just ask that everyone who participates checks out and comments on at least a couple of the other participants’ posts. The whole idea is swapping ideas and making connections, after all! Hey, thanks for the post. That sounds like a great idea, I’d definitely love to submit something. I’ll get writing and contact you before the submission date. Thanks for telling me about it – sounds like a lot of fun!